The city has developed and put in place a coherent public art policy (including, since 1985, the Percent for Public Art Program). After the call for submissions and the adjudication of the juried competition, once the artist has the commission for an art piece, what goes into its actual creation? 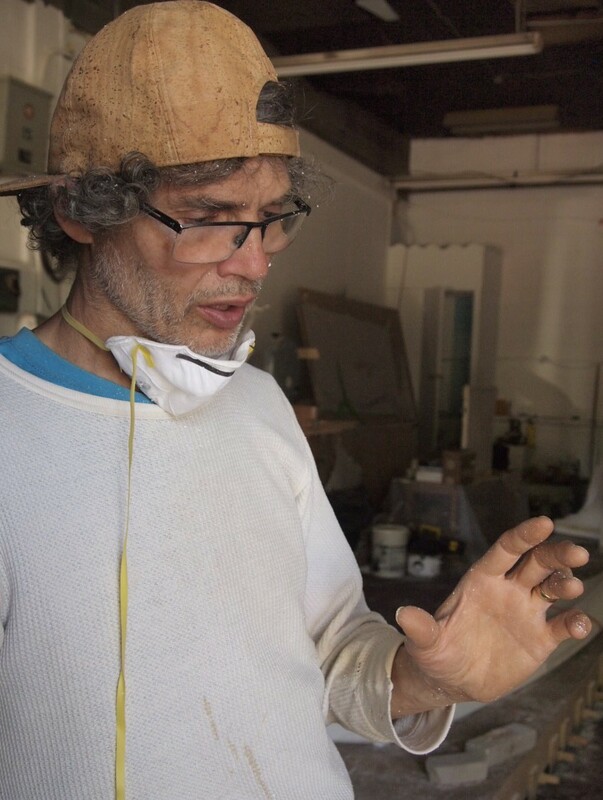 Sculptor Alexander Moyle is working on To The River, a set of bronze sculptures which will be installed near the Humber in 2015. He is inspired to represent human figures and plant life responding to the river’s flow with three pieces – Turbulence, Repose and Navigator – to bring awareness of the nearby river to the street. Before the commission is awarded, a great deal of time and work goes into the submission, including drawings and the making of small maquettes of the proposed figures. After it is awarded, then the large scale work begins. An artist working in a public context is responsible for many factors extraneous to the art itself. Challenges include all the specifications of the site and its buildings and all the underground infrastructure such as gas lines, water mains, sewers and electrical wires; sight line considerations for security and for traffic if any is nearby; overhead wires and structures. The site itself requires 3-D measurements and considerations. Coordinating schedules with the building construction can make deadlines oppressive and stressful. Once the site is assessed and a concept is formed, Moyle continues to make small maquettes to develop and refine his conception. 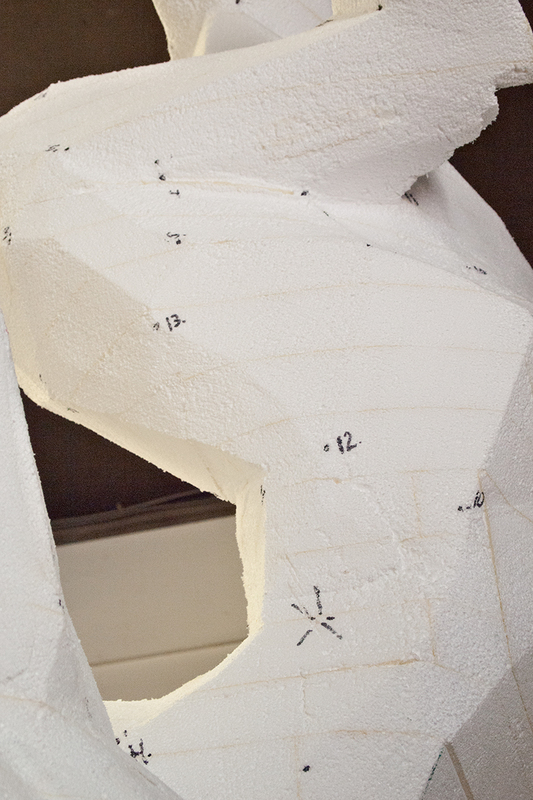 The challenge in large scale sculpture is to scale up from the maquette to the actual size without losing the proportions and thus the integrity of the piece. 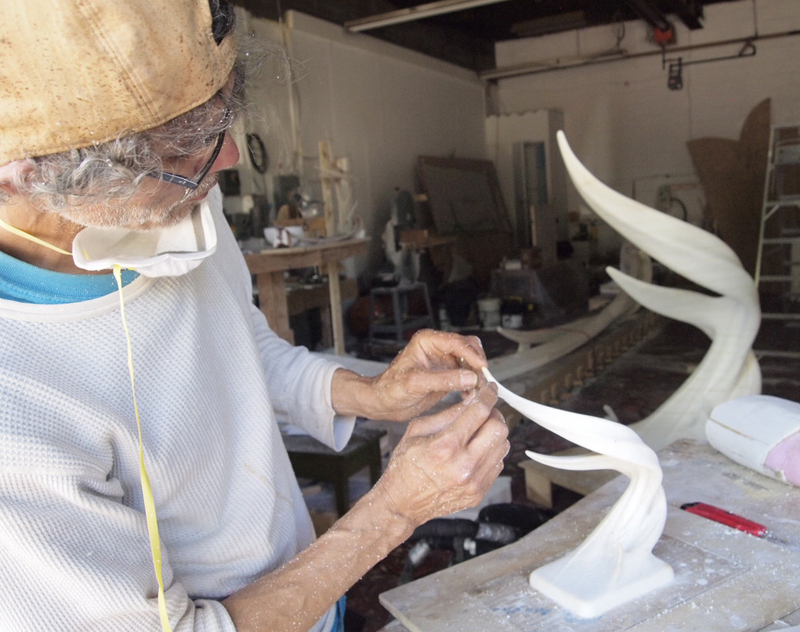 His full-size works begin their life as styrofoam, which can be cut and sanded into the shape. Measurements must be taken in 3-D and relationships between key points on the piece marked and constantly monitored. Long sweeping strokes with a sand block transform the initial blocky construction into a smooth, flowing shape. Meeting deadlines requires hiring help, which creates its own problems. 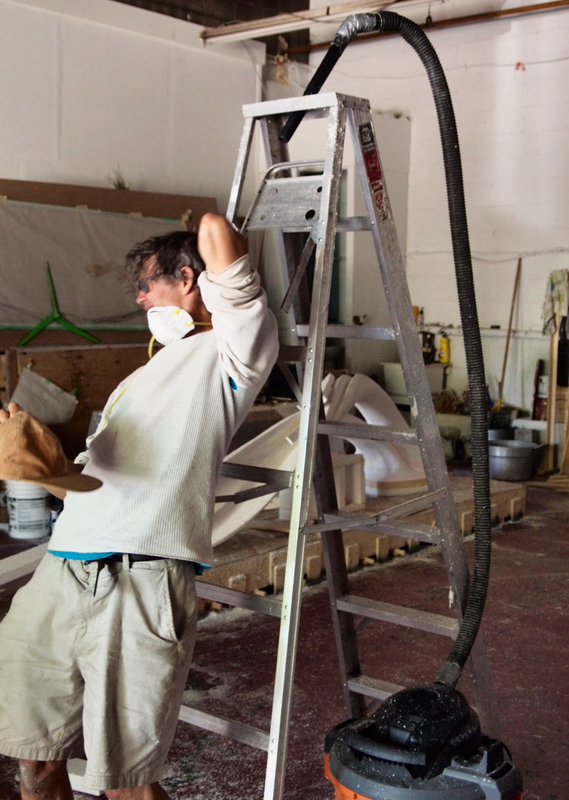 Everyone has a different touch and stroke in sanding and there are mistakes the artist must rectify as work proceeds. The facets and details are cut in when the sanding is done. Styrofoam as a medium has advantages such as lightness and workability, but it can cause divorce. Tiny white particles adhere to every part of Moyle, even his eyelashes. At the end of the day he uses his shop vacuum to rig up an air shower before going home. When the sculpture is completed in styrofoam its surface is coated in layers of plaster with burlap added for reinforcement. 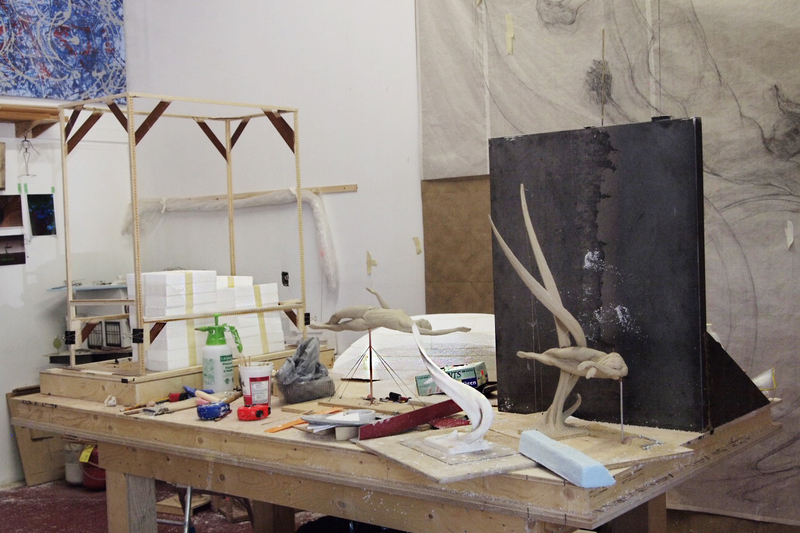 In order to make the bronze, the plaster shape is then cut into pieces, the styrofoam removed from inside, sand casts made from the pieces of plaster, and bronze poured into those sand casts at a foundry. When all the bronze pieces are assembled, welded together and polished, the work exists as a finished bronze sculpture. All this is still ahead. Years in the making, it will be a permanent enrichment of urban life. 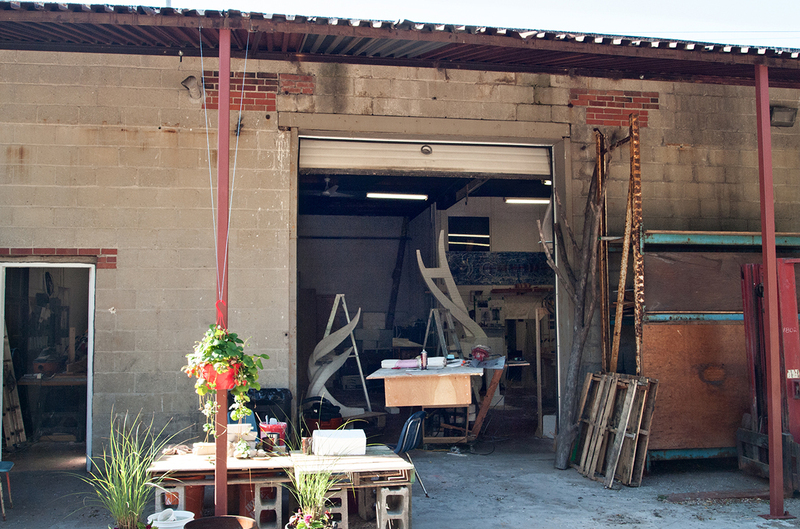 This article is part of our issue: Public Space/Public Art. Read about the next stage of this project in our update, PROGRESS: The Beginning of the Bronze Age.